Took me by complete surprise to read the ending. Right through this book I just could not work out what Emma was in psychiatric care for and seemingly to be bordering on being catatonic. A good book and different from the norm. Well written. 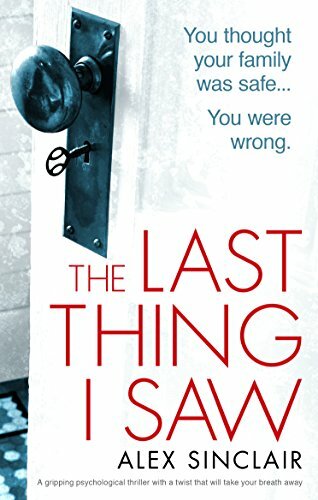 The Last Thing I Saw is a psychological thriller written in a concurrent before-and-after style. The prologue sets up the suspense of the story right away, with the protagonist, Emma, pointing a gun at someone, having to make a very difficult decision. At the beginning of the first chapter, she finds herself in a psychiatric hospital with no recollection of the events leading to her being there. The story ensues with her psychiatrist, Dr. Shaw, helping her recall the trying incidents that occurred, while other key players emerge through the telling of her memories as Emma recalls them. Emma’s character was written well, but I would have liked most of the others to be more fleshed out. They were believable, but I found it difficult to be invested in most of them as they seemed one-dimensional. There was more than one antagonist, which lends to the suspense factor, but you will need to read to end to discover the twists and turns that confuse the reader – in a good way – and end with the “big reveal”. I found this book to be engaging and suspenseful, but there were some chapters that were slower than others, and there was at least one element of the storyline that was unresolved. Additionally, the ending seemed slightly rushed, which was a little disappointing. Generally, though, I was interested in what memories would emerge with each of Emma’s sessions with Dr. Shaw, and that kept me reading. In my experience, that means I like the author’s style and will add more of Sinclair’s books to my to-read list. I do recommend you read The Last Thing I Saw and look forward to reading more by Alex Sinclair. Thank you to NetGalley, Bookouture, and Mr. Sinclair for the advanced copy and the opportunity to review this book. The dual timelines in this book, before and after, help to make the story flow and build the suspense for the final reveal at the end. The main character, Emma, has some memory loss and is working on getting back that memory to help her and her family. The fast pace, well-written characters, plenty of suspense and surprise ending is what makes this book a must read. I received a copy of this book via Netgalley.